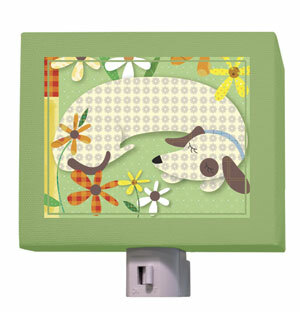 This Oopsy Daisy "Sleeping Dog" nightlight brings a cute and adorable companion into your little dog lover's room. This nightlight can be easily wiped clean with a soft, dry cloth and is ideal for your child's room as it does not have a glass surface to break. You can personalize the nightlight with your child's name or any other word or phrase like "Good Night". 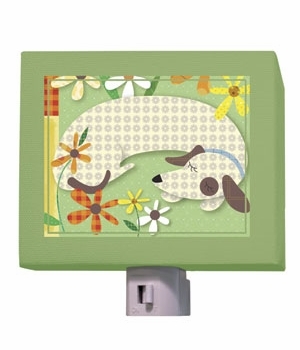 This nightlight is designed by Jessica Flick, whose biography is included with each unit. Dimension : 4.78" x 4"
The Oopsy Daisy collection donates a portion of their annual sales to charities that directly assist children. This piece is custom made to order and ships directly from the designer.